Knowledge Management (KM) is a conscious strategy of getting the right information to the right people at the right time so they can take action and create value. Basing KM on three major studies of best practices at one hundred companies, the authors demonstrate how managers can utilize a visual process model to actually transfer best practices from one business unit of the organization to another. Rich with case studies, concrete examples, and revealing anecdotes from companies including Texas Instruments, Amoco, Buckman, Chevron, Sequent Computer, the World Bank, and USAA, this valuable guide reveals how knowledge treasure chests can be unlocked to reduce product development cycle time, implement more cost-efficient operations, or create a loyal customer base. Finally, O'Dell and Grayson present three "value propositions" built around customers, products, and operations that could result in staggering payoffs as they did at the companies cited above. No amount of knowledge or insight can keep a company ahead if it is not properly distributed where it's needed. Entirely accessible and immensely readable, If Only We Knew What We Know is a much-needed companion for business leaders everywhere. Knowledge management is really about recognizing that regardless of what business you are in, you are competing based on the knowledge of your employees. WHAT DO WE MEAN BY "KNOWLEDGE"? The recorded study of learning and knowledge dates back at least to Plato and Aristotle; however, its modern-day exploration is credited to thinkers like Daniel Bell (1973), Peter Drucker (1993), Alvin Toffler (1970, 1980), and the philosopher Michael Polanyi (1958, 1967). Polanyi's work served as the basis for the much-acclaimed knowledge management theories and books by the Japanese organizational learning guru, Ikujiro Nonaka (1991, 1995) -- as of September 1997 appointed Xerox Chair of Knowledge at his alma mater, The Haas School of Business, the University of California at Berkeley. Polyani and Nonaka both point out that knowledge comes in two basic varieties: tacit and explicit, also known as informal/uncodified and formal/codified. Explicit knowledge comes in the form of books and documents, white papers, databases, and policy manuals. The tacit/uncodified variety, in contrast, can be found in the heads of employees, the experience of customers, the memories of past vendors. Tacit knowledge is hard to catalogue, highly experiential, difficult to document in any detail, ephemeral and transitory. Both types of knowledge are important. Some may argue that, in a commercial context, tacit knowledge does not qualify as "knowledge" at all. just as value is defined by the " transfer price" in the context of Seller/buyer interaction, thoughts in our heads are not "knowledge" until they enter the marketplace of ideas via discussion and interaction. "It is the intersection between tacit knowledge and explicit knowledge that creates learning," Nonaka wrote in the February 1994 issue of Organizational Science. For example, a manager who has just tried out a new sales technique has "tacit" knowledge of it. If he writes it down and posts it on his company's intranet site, some of that knowledge has become captured and " explicit." Next, another sales manager reads the description and uses the technique on her next sales trip (hence turns it into "tacit" once more). Knowledge has been captured, exchanged, and created (see Steps in the Knowledge Transfer Process, below). The learning process hence involves the continuous "intersection" of these two knowledge types and a never-ending, closed-loop transformation process. Other organizational experts, such as Leif Edvinsson of Skandia, further divide commercial knowledge into individual, organizational, and structural knowledge. Individual knowledge is solely in the minds of employees. Organizational knowledge is the learning that occurs on a group or division level. Structural knowledge is embedded in the "bricks" of the corporation though processes, manuals, and codes of ethics. At any one of these three "states, the knowledge can be either tacit or explicit. Knowledge is broader than intellectual capital (IC). Whereas some writers have chosen to expand IC to include practices and processes, in its purest form, IC refers to the commercial value of trademarks, licenses, brand names, formulations, and patents. In this view, knowledge-as-intellectual-capital is an asset, almost tangible. Our use of knowledge is broader: we view knowledge as dynamic -- a consequence of action and interaction of people in an organization with information and with each other. Knowledge is bigger than information. Our organizations are awash in information, but until people use it, it isn't knowledge. While you can't have too much knowledge, you can certainly have too much information. Indeed, many organizations have already discovered that information, carried faster and in greater volumes by electronic media, leaves employees overwhelmed, not overconfident. Fumbling rather than focused. Paralyzed rather than proactive. Hence, our simple working definition: Knowledge is information in action. 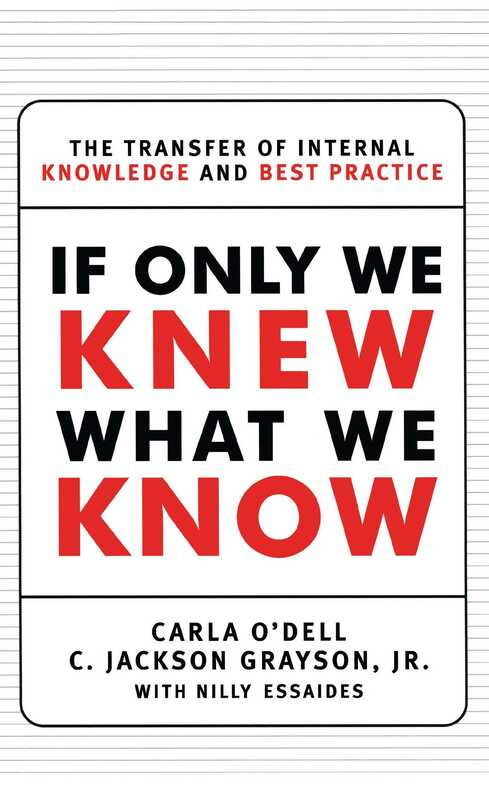 In the organizational and commercial context of this book, knowledge is what people in an organization know about their customers, products, processes, mistakes, and successes, whether that knowledge is tacit or explicit. Data (facts and figures, without context and interpretation), and information (patterns in the data), are not in themselves knowledge (actionable information). For example, when a British supermarket chain implemented a high-end customer data-mining application, it began to accumulate data on buying behavior. It then took the data and ran correlation analyses among the seemingly unrelated points to reveal buying behavior patterns. For instance, the chain quickly found a clear correlation between the purchases of diapers and beer on Friday afternoon. It took this curious piece of information, and hypothesized that men, on a Friday afternoon shopping expedition, are likely to buy beer (for themselves) and a pack of diapers (as per their wives' shopping list). Armed with this knowledge about its customers' behavior, the store took action and reconfigured the locations of diapers and beer on its shelves. This leads us to the next fundamental question. Knowledge management (KM) is not a new religion or a spiritual calling. It is not an attempt to rally disgruntled employees around an appealing philosophical concept. It is not a science or a "discipline" -- yet. It is not the latest management fad. When explicitly managed, organizational knowledge is used to accomplish the organization's mission. Knowledge management is therefore a conscious strategy of getting the right knowledge to the right people at the right time and helping people share and put information into action in ways that strive to improve organizational performance. Fortunately, most companies have some experience already in managing knowledge. Indeed, KM is not a radical departure or a methodology in and of itself. Rather, it is a framework, a management mind-set that includes building on past experiences (libraries, databanks, smart people) and creating new vehicles for exchanging knowledge (knowledge-enabled intranet sites, communities of practice, networks). For most organizations, KM represents a continuation of efforts begun in other times with other names (or acronyms), all of which have likely yielded valuable learnings. Radical reengineering may have not delivered sustainable success, but it has "delivered" the mind-set of the process-oriented organization. Processes can be made explicit, and knowledge about how to make them work can be transferred. Not surprising, newly trim and lean, reengineered companies like Amoco, Chevron, and Texas Instruments have been at the forefront of the KM "[r]evolution." Companies like these have been among the first to realize that to accelerate growth -- again -- they must adopt new approaches that leverage their internal expertise. This leads us to another building block in the foundation for the remainder of this book. of this seemingly simple process. Every knowledge management and transfer initiative we will describe had to design approaches to address all of the steps in the knowledge transfer process shown in Figure 1.1. Most companies start their organized efforts by focusing on creating, identifying, collecting, and organizing best practices and internal knowledge, in order to understand what they know and where it is. Later on, we'll cover the difficulties in these early stages, especially when dealing with tacit knowledge and know-how. As we stated earlier, just knowing that the practices or knowledge exists is not enough to ensure transfer or use. The process must explicitly address sharing and understanding of those practices by motivated recipients. Finally, the process involves helping the recipients adapt and apply those practices to new situations, to create new "knowledge" and put it in action. This is where the payoff really comes. DOES MANAGING AND TRANSFERRING KNOWLEDGE REALLY WORK? It does -- big time -- and for a growing number of companies, large and small, private and public, in services and in manufacturing, in high tech and in chemicals. From the National Security Agency (NSA), to Texas Instruments, from Chevron to Verifone. Megasize multinationals and small, niche players. At Dow Chemical, early efforts to manage intellectual capital brought an immediate kick-back in the form of $40 million in savings. Analysis of existing patents to determine which technology streams were the strongest and which were weakest allowed more effective negotiations with joint venture partners. At Kaiser Permanente, benchmarking of their internal best practices helped drastically cut the time it took to open a new Woman's Health Clinic. And it opened smoothly, with no costly start-up problems. At CIGNA Property & Casualty, knowledge-sharing efforts, combined with a reengineering campaign, lifted profits back into the black. In 1993, CIGNA lost more than a quarter of a billion dollars. By 1995, it sported a $90 million profit and has continued with healthy profits since then. Skandia has leveraged internal know-how to dramatically reduce start-up time for new ventures to seven months, compared to an industry average of seven years. By comparing practices on the operation of gas compressors in fields in California, the Rockies, and offshore Louisiana, a Chevron team learned that they could save at least $20 million a year just by adopting practices already being used in their best-managed fields. Chevron's network of 100 people who share ideas on energy-use management has generated an initial $150 million savings in Chevron's annual power and fuel expense by sharing and implementing ideas to reduce company-wide energy costs. By 1996, Chevron could credit this best-practice transfer team with generating over $650 million in savings. And they're still going. At USAA, knowledge management increased the proportion of business conducted over the phone with members from 30 percent to 70 percent and helped establish ten new strategic alliances. We will get back to these examples later in the book and in greater detail. But you get the point. We certainly did. And for us, it was a point of no return. There was no way we could ignore this outpouring of experience, interest, and practice. We knew just how much there was to know. And we set about to find out as much as we could. Copyright &copy; 1998 by Carla O'Dell and C. Jackson Grayson, Jr.
3. How do we share knowledge and practices now? What works well? What doesn't? 8. What can we, as individuals, do in our own work life to benefit from and contribute to knowledge transfer and use? 9. What issues will arise in our organization that this book failed to address?